This past week, President Xi Jinping signalled a growing sense of insecurity in China by harping on what one official WeChat account called “a comprehensive view of national security” at a meeting in Beijing of top provincial officials. The meeting was called in official media coverage a “provincial-level special topic discussion for principle leaders and cadres on persevering in baseline ideologies and striving to prevent and defuse major risks.” That’s a mouthful. But the basic sense was that times are tough for the Party and for the country, and it is now critical for the Party to maintain “ideological security” in order preserve its ruling position. In a further sign of unease, a top expert on public financing in China, Jia Kang (贾康), told a forum in Beijing that the country had to take more active measures to lower taxes and fees on businesses in order to encourage growth, and that the country need to overhaul its pensions system. Also this week, the Ministry of Foreign Affairs confirmed that writer Yang Hengjun (杨恒均) is being held in Beijing on suspicion of “engaging in criminal activities that damaged China’s national security.” There is no indication yet of what exactly this means, or why it is happening now. We provide a list below of Yang’s writings from the CMP archives, which might help readers better understand Yang’s work and ideas. Screenshot of coverage at People’s Daily Online of meeting of provincial leaders in Beijing. 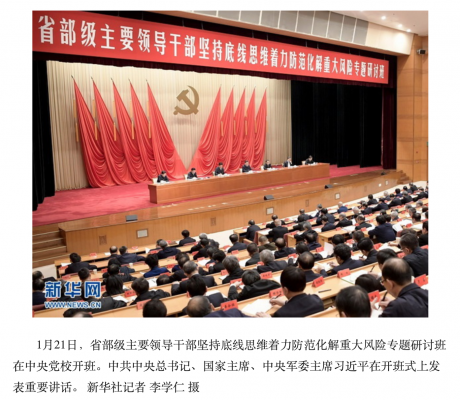 From January 21-25, a Party conference with the dizzying name “provincial-level special topic discussion for principle leaders and cadres on persevering in baseline ideologies and striving to prevent and defuse major risks” (省部级主要领导干部坚持底线思维着力防范化解重大风险专题研讨班) was held at the Central Party School in Beijing. All seven members of the Politburo Standing Committee, including President Xi Jinping, were present for the session, signalling its importance. “Xia Ke Dao” (侠客岛), a WeChat public account maintained by the overseas edition of the People’s Daily, ran a commentary that said: “The major risks raised during this discussion session are clearly even more comprehensive. Xi Jinping’s speech dealt with major risks in politics, ideology, the economy, science and technology, society, the external environment, Party construction and other sectors, and it could be summed up as ‘a comprehensive view of national security’ (总体国家安全观).” Xi placed ideological security (意识形态安全) in his remarks on political security (政治安全), emphasising two points: the internet and youth. Xi emphasised the need to ensure that the youth become the next generation of socialist builders, or shehui zhuyi jianshezhe (社会主义建设者), and successors (接班人). This, said Xi, was the meaning of ideological security, and concerns the political security of maintaining of the Party’s ruling status (执政地位). 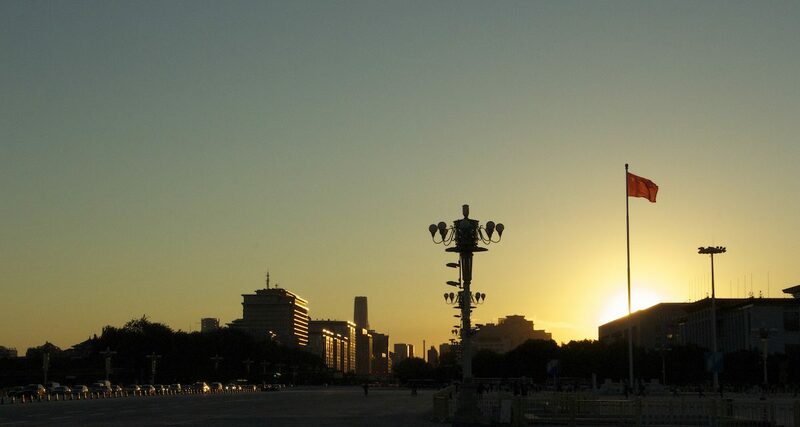 Several state media, including the Legal Daily and Guangming Daily, reported this week that individual and corporate taxpayers in the film and television have reported 11.74 billion yuan in payable taxes since the Central Propaganda Department and four government bureaus launched a campaign in October 2018 to regularise (规范) tax reporting in the film and television industries, which have been accused of rampant use of such workarounds as “shadow contracts.” Of these payable taxes, reporting during a two-month period of “self examination and self correction” (自查自纠), a total of 11.53 billion yuan has already been paid to the government. The period of “self examination and self correction” has now ended, and the authorities say they will commence a phase of “supervision and correction” (督促纠正), meaning that the government will investigate and audit people and companies in the film and television industries to ensure compliance. According to the Guangming Daily newspaper, total box office revenues in China were 60.9 billion yuan in 2018, up 9 percent from 2017. The box office take by state-produced (国产电影) films in 2018 was 37.9 billion yuan, accounting for 62 percent of the total box office. Jia Kang (贾康), the deputy chairman of the Society of Public Finance of China (中国财政学会) and former head of the Research Institute for Fiscal Science at China’s Ministry of Finance, advised at a forum in Beijing that China quickly move to “lower tax and fees” (减税降费) in order to encourage entrepreneurship and innovation, and that it overhaul the pensions system, redirecting accumulated surpluses in China’s south from recent years in order to offset serious shortfalls in the northwest. Following these remarks, the Beijing News pointed out that according to the “2016 Annual Report on Social Insurance Development in China” released by the Ministry of Human Resources and Social Security, there were seven regions in 2016 where pensions were not paid out. They included the northwestern province of Heilongjiang, where the accumulated balance of pension funds was negative 23.2 billion yuan. At a routine press conference on January 24, a spokesperson for the Ministry of Foreign Affairs said that Australian citizen Yang Jun (杨军) — a blogger better known to the public by the pen name Yang Hengjun (杨恒均) — was suspected of “engaging in criminal activities that damaged China’s national security” (从事危害中国国家安全的犯罪活动) and was being held by police in Beijing while under investigation. 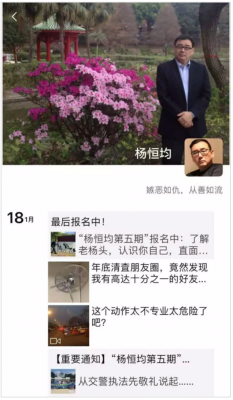 The WeChat public account “San Xiang Commentary” (三湘评论) posted a screenshot of Yang Hengjun’s WeChat account, noting that he generally posted on a daily basis but had not been active in chat groups since January 18. The following is a list CMP’s translated writings from Yang Hengjun dating back from 2010 through to his first detention in March 2011.